OK, Time To Roast Some Pigs! Serve Your Best Arkansas Razorback Jokes! Q: What do you call Arkansas when they find out they can't throw the ball on Alabama? Q:What do you call a pig with three eyes? 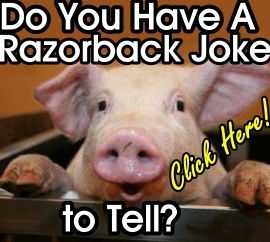 Q: Did you hear the story about the razorback hog? Q: How does a Petrino write up plays for Arkansas? A: With a pig pen. Two Arkansas grads were walking in the woods. One said, "Look! A dead bird." The other looked to the sky and said, "Where?" What's a seven course meal in Fayetteville? A possum and a six-pack. Where was OJ headed in his white Bronco? To Arkansas. He knew the police would never look for a Heisman winner there. What is the line heard most from graduates of Arkansas' business school? They like to get them right out of high school!